Bush tucker is back on the menu for one Queensland Indigenous group hoping to develop a sustainable social enterprise harvesting native bush foods. In a series on social enterprises, Lina Caneva takes a look at Murri Munchies. 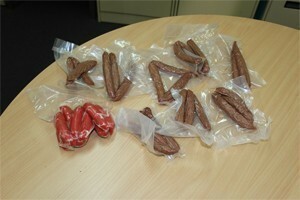 Nutritional kangaroo suasages which contain about 30% vegetables and are low GI alongside some kangaroo cheerios. FEATURE: The concept of ‘bush tucker’ is uniquely Australian – romanticised by Hollywood as something Crocodile Dundee survived on – but now a group of Indigenous Queenslanders wants to turn the harvesting of native bush foods into a sustainable social enterprise. With the catchy name of Murri Munchies Ltd, an alliance of community groups lead by the Murri people, from the remote and regional Indigenous communities of the Wide Bay/Burnett region of Queensland, has created a micro social and economic enterprise focussing on bush foods. And they are looking for a unified approach to the project to ensure greater access to expertise, knowledge, skills and experience. Led by project manager, Andrew Normoyle, a Murri man with extensive experience in food technology and production, Murri Munchies has done its homework to ensure that producing native bush food for a wide marketplace is sustainable yet remains faithful to their Aboriginal and bush culture. “The “Feasibility of a Sustainable Bush Food Industry in Western Queensland, 1997” indicates that most of the major companies purchasing bush foods prefer to purchase from one organisation, rather than small amounts from a number of suppliers,” Normoyle explains. Their research has shown that the “Australian Bush Foods Industry” has the capacity to expand exponentially if the two major hurdles of guaranteed supply and uniform quality can be overcome. The Murri Munchies group says it has addressed these issues and is confident that they can meet the demand through internationally recognised Quality Assurance programs. “The native food supply chain is currently very small and fragmented; however the demand for quality native foods for the retail and food-service industries with guaranteed supply is increasing exponentially,” Normoyle says. He says the Australian native food industry is currently valued at $AUD 16m and although it is steadily expanding in size and diversity, there is ample scope for the industry to significantly expand both domestically and internationally. “Indigenous people and communities in our region have a thirst for economic stability and a quality of life that is based on and supports their traditional culture,” Normoyle says. 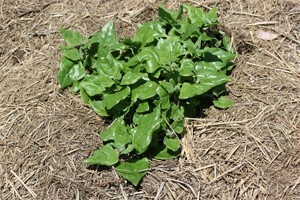 Warrigul greens grown by Murri Munchies. Photo supplied. The aim is to operate in culturally sensitive ways to ensure the traditional culture of communities and their ancestors is not lost. “The Murri Munchies Ltd steering committee has acknowledged a global need and desire for Australian Native Bush Foods as well as the great need for Indigenous communities to become sustainable through social and micro ventures based around the production of traditional and native foods. “We are focussing on bush foods, however this is not limited. Many of our members are in the process of creating business not related to food, such as tourism and cultural awareness. “We are united over five Regional Council areas (about 37,000km.) with many of the local Councils becoming associate members. Normoyle says the plan is to start small and then expand. “Initially the products will be supplied by individuals and small organisations. The produce will be sold on a wholesale basis to up-market restaurants and niche food service organisations. “Our research indicates that a very large potential market originates from Europe. Already communities within Cape York, Northern Territory and southern New South Wales have expressed an interest in becoming involved with the Murri Munchies project, however Normoyle explains that the Board of Directors has determined that the operation will prove itself within the Wide Bay/Burnett area first. But Normoyle understands that the success of the project may lie in support at a higher level. The bush is calling and the Alliance is raring to go.